The Men’s basketball team had a strong season, finishing with an overall record of 18-13 and 9-9 in the Gulf Coast Athletic Conference tournament. Belhaven started off strong by winning eight of their first nine games of the year, including victories over Blue Mountain College, Wesley College and cross town rival Millsaps College. Belhaven then proceeded to take three of their next four games, including a big road win over Lambuth University who was ranked 14th in the country at the time. This strong season opening garnered them a ranking of 19th in the December 8th edition of the NAIA Top 25 Poll. The Blazers then dropped six of their next seven games and started the conference schedule with a 1-4 record. Belhaven balanced those losses with wins in four out of seven games to go to 13-10 overall and 5-7 in the GCAC. The Blazers then exploded for three straight victories over William Carey, Mobile, and Southern University of New Orleans, raising their record to 16-10 and 8-7 in conference play. Following a couple of tough home losses, the Blazers capped off the regular season by beating Tougaloo College on the road who was ranked 20th in the nation at the time. 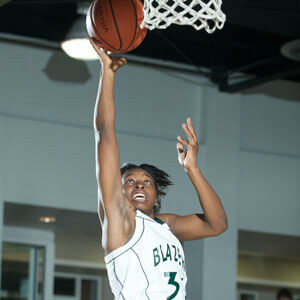 The GCAC semifinals brought the Blazers’ season to a close with a loss to LSU-Shreveport. Several players led the Blazers in the 2008-09 campaign: Korey Whiting averaged 14.2 points per game and grabbed a GCAC lead with an average of 7.84 rebounds per game; Nathaniel Rochè averaged 14.1 points and 8.6 rebounds per game; and Iman Walcott had a season average of 12.5 points and 5.4 rebounds per game. 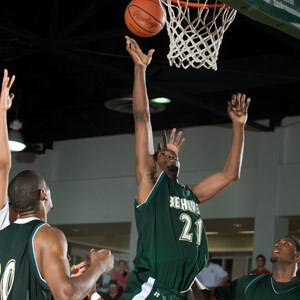 Belhaven will lose seniors Julien Marion, Iman Walcott, Dax Miller, and Thomas Tunberg, but with a number of solid players returning, 2009-2010 should be an exciting season for Belhaven basketball. The Lady Blazers finished their 2008-09 campaign with an overall record of 17-14 and 8-10 in the Gulf Coast Athletic Conference. Belhaven had a hot 3-0 start with two wins over Blue Mountain College and a win against Wesley College. Then the Lady Blazers suffered a loss to Freed-Hardeman University, who was ranked 3rd in the NAIA Preseason Top 25 poll. Four straight victories against Wesley College, East Texas Baptist University, LeTourneau, and Wiley College improved their record to7-1 on the season. In their tour of the great Northwest, the Lady Blazers lost to tough 24th ranked Carroll College and Montana State-Northern University. To balance these losses, Belhaven reeled off wins against East Texas Baptist, Wesley, and Spring Hill College. Over the next six games, Belhaven went 3-3 with key conference victories against the University of Mobile, Dillard, and Southern University of New Orleans, raising their record to 13-6 and 4-3 in the GCAC. Belhaven suffered a pair of defeats to Tougaloo College and William Carey, but they rebounded by winning four of their next five games to improve to 17-9 overall and 8-6 in the conference. Unfortunately, some injuries started taking their toll on Belhaven’s players, and the season came to a close in the quarterfinals of the GCAC tournament at William Carey. Several players led the team: Jaelyn Stringer and Jira Williams turned in outstanding seasons for the Lady Blazers, averaging 14.4 and 13.8 points per game, respectively. Both players also averaged just under six rebounds per night and were selected to the GCAC All-Conference team. Holly Dial had a solid senior season by averaging 8.5 points per game and made 35.7 percent of her three point attempts, and she set a new school record for most three pointers in a game, with seven against Dillard. As a team, the Lady Blazers were third in the nation in turnover margin (5.55) and 15th in the country in steals per game (just over 11 per contest). Belhaven is losing seniors Holly Dial, Jaelyn Stringer, Molly Yildirm, Jimesha Rule, Jamie Dominio, and Lauren McDaniel but will return Jira Williams and Courtney Ward, who led the team in assists. They will lead the Lady Blazers during 2009-2010 which promises to be another eventful season.